Growth Hormone, or GH, therapy has become very popular over the last 10 years as a method of decreasing the effects of aging. But the associated and intentional increase in IGF1, or Insulin Like Growth Factor Type 1, has been highly associated with oncogenisis, causing an increase in cellular proliferation, suppression of apoptosis, and increased risk in over 30 different types of cancers. However, there is a way to increase endogenous, or your body’s own, GH while decreasing the undesired IGF1. The story of and the science behind Trans-D Tropin will be explained. 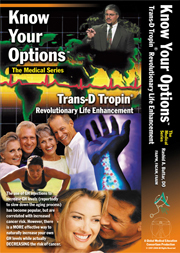 Click here to learn more about or order Trans-D Tropin now!